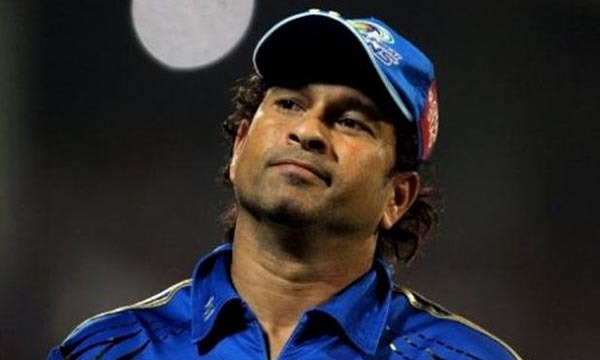 The National Basketball Association, or NBA in short, one of the four important professional level basketball leagues, is considered the most prestigious professional league of basketball for men, not only in North America but in the entire world. 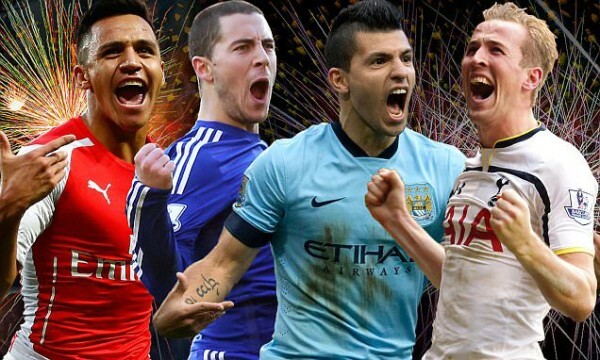 There are 30 franchise member clubs. Despite being one of the modern sports, basketball has gained huge popularity all over the world, and NBA is attended by a large number of followers. Naturally, the league needs to be played in arenas that are capable of catering comfortable seating arrangements and good view of the games to people who want to witness the adrenalin rush, up close and personal. There are many NBA Arenas, and they can be ranked on the basis of the year of construction, capacity, largeness, etc. let us take a look at the Top 10 NBA Arenas with Largest Capacity. Multi-purpose indoor venue The Oracle Arena, previously known as The Arena in Oakland, is located in Oakland, California, and is the home of the Golden State Warriors of the Pacific Division of the Western Conference in the NBA. With its 19,596 seating capacity for basketball matches, it is the number 10 arena in our list of Top 10 NBA Arenas with Largest Capacity. The Oracle Arena is currently operated by the AEG Facilities. The construction of the arena started on April 15, 1964, and it was officially opened for public on November 9, 1966, and has a construction cost of nearly $25 million. The main architects of this arena were Skidmore and Owings and Merrill, and Guy F. Atkinson Company worked as the Project manager of this NBA arena. 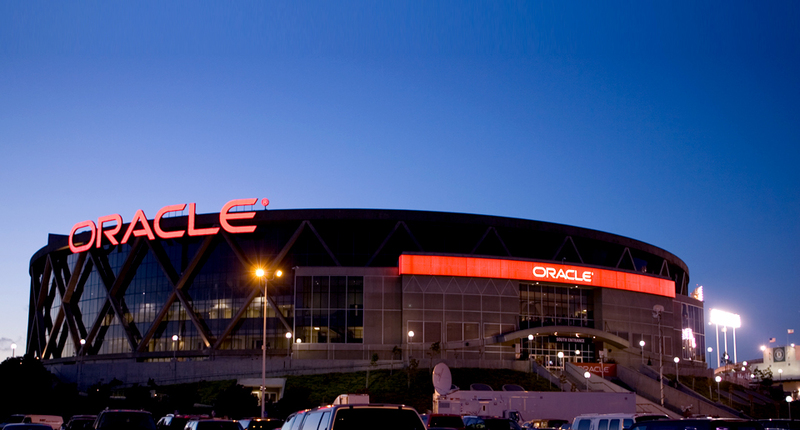 Oracle Arena also contains a multipurpose outdoor stadium known as O.co Coliseum besides its famous indoor arena. 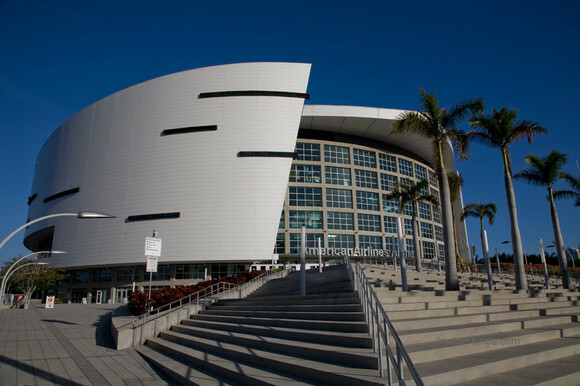 American sports and entertainment venue The American Airlines Arena is located in Downtown Miami, Florida, and is the home of the Miami Heat of the NBA. The naming right of this arena was purchased by American Airlines. With its 19,600 seating capacity for basketball matches, it is the number 9 arena in our list of Top 10 NBA Arenas with Largest Capacity. The American Airlines Arena is currently operated by the Miami-Dade County. The construction of the arena started on February 6, 1998, and it was officially opened for public on December 31, 1999, and has a construction cost of nearly $213 million. The main architects of this arena were Arquitectonica and 360 Architecture, and Parsons Brinckerhoff worked as the Project manager of this NBA arena. American Airlines Arena, besides its regular seating arrangement, also has 2,105 club seats, 80 luxury suites and 76 private boxes. Multi-purpose indoor sporting venue The Air Canada Centre is located in Downtown Toronto, Ontario, and is the home of the Toronto Raptors of the NBA, the Toronto Maple Leafs of the NHL and also the Toronto Rock of the NLL. With its 19,800 seating capacity for basketball matches, it is the number 8 arena in our list of Top 10 NBA Arenas with Largest Capacity. 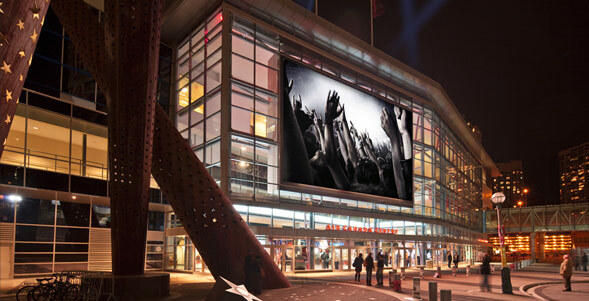 The Air Canada Centre is currently operated by the Maple Leaf Sports & Entertainment. The construction of the arena started on March 12, 1997, and it was officially opened for public on February 19, 1999, and has a construction cost of nearly $265 million. The main architects of this arena were Brisbin Brook Beynon, Architect of Record and Populous, and Clarendon Projects Ltd worked as the Project manager of this NBA arena. Air Canada Centre was the fifth busiest arena in the world as per 2008 survey reports. American multi-purpose indoor venue The Madison Square Garden is located in Midtown Manhattan, New York City, and is the home of the New York Knicks of the NBA and also the New York Rangers of the NHL. This arena is the oldest and most active sports complex in the New York City metropolitan area. With its 19,812 seating capacity for basketball matches, it is the number 7 arena in our list of Top 10 NBA Arenas with Largest Capacity. 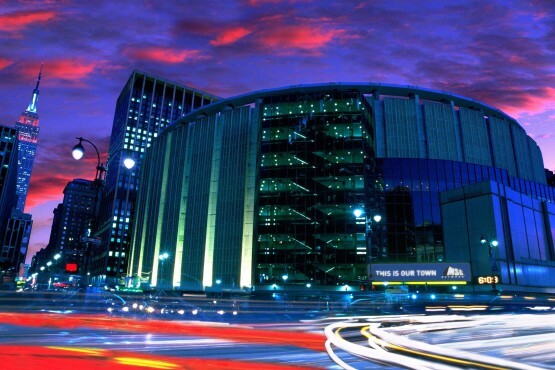 The Madison Square Garden is currently operated by the Madison Square Garden Company itself. The construction of the arena started on October 29, 1964, and it was officially opened for public on February 11, 1968, and has a construction cost nearly $123 million. The main architects of this arena were Charles Luckman Associates and Brisbin Brook Beynon Architects, and Severud Associates worked as the Project manager of this NBA arena. Multi-purpose indoor venue The Energy Solutions Arena, previously the Delta Center, is located in Salt Lake City, Utah, and is the home of the Utah Jazz of the NBA. 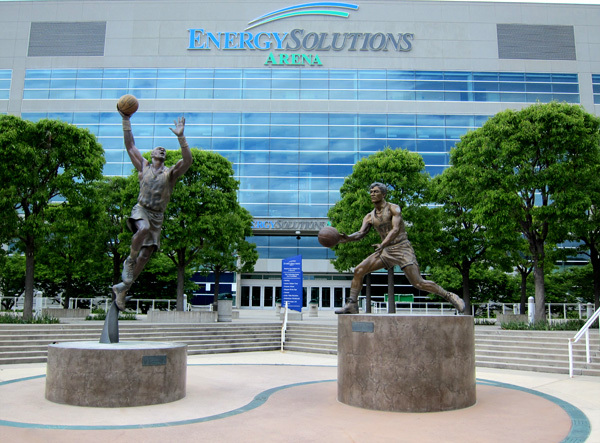 The naming right of this arena was purchased by the Energy Solutions on November 20, 2006. With its 19,911 seating capacity for basketball matches, it is the number 6 arena in our list of Top 10 NBA Arenas with Largest Capacity. The Energy Solutions Arena is currently operated by the Larry Miller Sports &amp; Entertainment. The construction of the arena started on May 22, 1990, and it was officially opened for public on October 4, 1991, and has a construction cost nearly $93 million. The main architect of this arena was FFKR Architecture, and Ralph L. Wadsworth Engineering worked as the Project manager of this NBA arena. 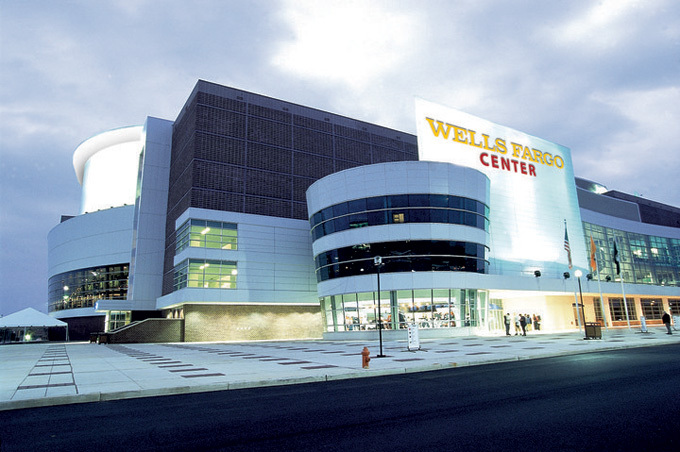 Multi-purpose indoor arena The Wells Fargo Center, previously the CoreStates Center, is located in Philadelphia, and is the home of the Philadelphia 76ers of the NBA, the Philadelphia Flyers of the NHL and the Philadelphia Soul of the AFL. With its 20,328 seating capacity for basketball matches, it is the number 5 arena in our list of Top 10 NBA Arenas with Largest Capacity. The Wells Fargo Center is currently operated by the Global Spectrum. The construction of the arena started on September 14, 1994, and it was officially opened for public on August 13, 1996, and has a construction cost of nearly $210 million. The main architect of this arena was Ellerbe Becket, and Fox Management Company worked as the Project manager of this NBA arena. Wells Fargo Center will host the WWE Royal Rumble in 2015 and will also host the Democratic National Convention in 2016. Sports and entertainment venue The Verizon Center, previously known as the MCI Center, is located in the Chinatown neighborhood of Washington, D.C., and is the home of the Washington Wizards of the NBA, the Washington Mystics of the WNBA and also the Washington Capitals of the NHL. With its 20,356 seating capacity for basketball matches, it is the number 4 arena in our list of Top 10 NBA Arenas with Largest Capacity. This arena is named after its sponsor the Verizon Communications. 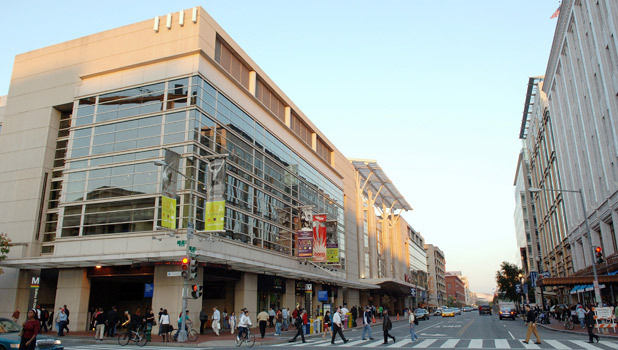 The Verizon Center is currently operated by the Monumental Sports and Entertainment. The construction of the arena started on October 18, 1995, and it was officially opened for public on December 2, 1997, and has a construction cost of nearly $260 million. The main architects of this arena were Ellerbe Becket, Devrouax & Purnell, KCF-SHG Architects, and Seagull Bay Sports worked as the Project manager of this NBA arena. Multi-purpose venue Quicken Loans Arena is located in Cleveland, Ohio, and is the home of the Cleveland Cavaliers of the NBA, the Cleveland Gladiators of the AFL and also the Lake Erie Monsters of the AHL. With its 20,562 seating capacity for basketball matches, it is the number 3 arena in our list of Top 10 NBA Arenas with Largest Capacity. The naming right of this arena was purchased by the retail mortgage lender Quicken Loans since August 2005. 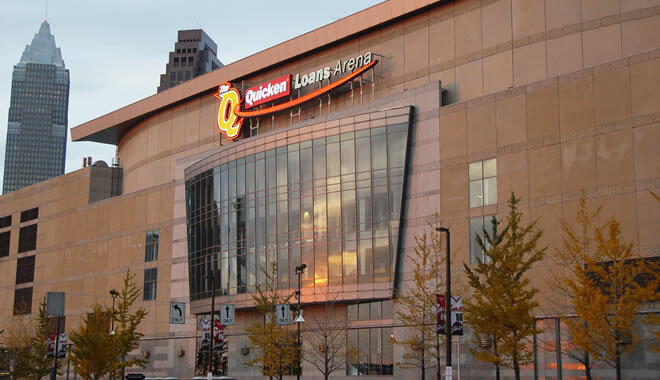 The Quicken Loans Arena is currently operated by the Quicken Loans Arena Company itself. The construction of the arena started on April 27, 1991, and it was officially opened for public on October 17, 1994, and has a construction cost of nearly $100 million. The main architect of this arena was Ellerbe Becket, and Seagull Bay Sports worked as the Project manager of this NBA arena. Indoor sports arena and entertainment venue United Center is located in Chicago and is the home of both the Chicago Bulls of the NBA and the Chicago Blackhawks of the NHL. With its 20,917 seating capacity for basketball matches, it is the number 2 arena in our list of Top 10 NBA Arenas with Largest Capacity. 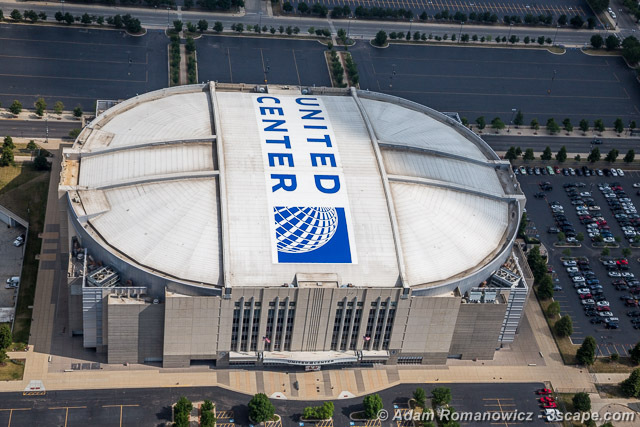 The United Center is named after its corporate sponsor the United Airlines which pays nearly $1.8 million per year for its naming rights. The United Center is currently operated by the United Center Joint Venture. The construction of the arena started on April 6, 1992, and it was officially opened for public on August 18, 1994, and has a construction cost of nearly $175 million. The main architects of this arena were HOK Sport, W. E. Simpson Company, Inc. and Marmon Mok, and International Facilities Group worked as the Project manager of this NBA arena. Sports and entertainment venue The Palace of Auburn Hills is the home of the Detroit Pistons of the NBA. With its 21,231 seating capacity for basketball matches, it is the number 1 arena in our list of Top 10 NBA Arenas with Largest Capacity. It was previously used as the home of Detroit Fury of the AFL, Detroit Shock of the WNBA, the Detroit Safari of the CISL and also the Detroit Vipers of the IHL. 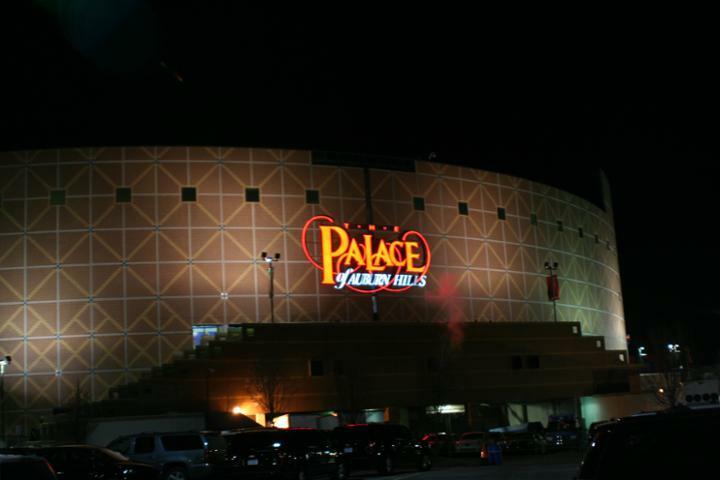 The Palace of Auburn Hills is currently operated by the Palace Sports and Entertainment. The construction of the arena started on June 7, 1986, and it was officially opened for public on August 13, 1988, and has a construction cost of nearly $70 million. The main architect of this arena was Rossetti Architects, and Frank Rewold and Sons worked as the Project manager of this NBA arena. This arena is also one of the only two NBA arenas which have not sold their naming rights yet. As we have seen, these stadiums are the home grounds of different NBA teams, and they not only serve as basketball arenas but also host other sports or other events. While the crowd enjoys a good game of basketball, it is also important for them to have a good ambience to enhance their experience, and these arenas do just that, and try to cater to the largest audience.